The gun was a train wreck.I was rooting around my safe and came across the Para Ordnance P-14*45 I used at the range just prior to retiring from the PD. I wanted something sub-stantial one way of saying .45 ACP in a 1911-style pistol, but I also wanted capacity. Para-Ordnance was the logical choice. My personal preference was a single action and not the LDA light double Para offers. I just can’t get used to the trigger pull and sear reset.I didn’t realize I’d been that hard on the gun. I’d worn it daily for about a year and it looked like I’d used it as a hatchet rather than a Rangemaster’s every day gun.The black Para Kote ?nish was worn in the spots you’d expect from countless draws from Kydex holsters,chipped and gouged in spots you’d never expect to be vulnerable, and scraped down to the quick in other places like I said, a train wreck. But, it still shot and that’s what’s really important isn’t it? Besides, 14 rounds in the magazine and one in the chamber is nothing to sneeze at. Serendipity took over at this point. (I know real men don’t use the word serendipity but it was my word of the week in the increase your vocabulary lesson and I have to use it at least once a day.) 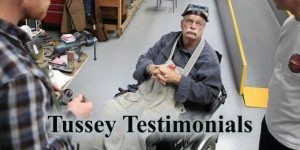 I was talking with old friend Terry Tussey about a gun he’d built for me years ago, and the “Para hatchet” came up in conversation. In his usual gruff, gravelly voice he said, “Send me the damn thing. They’re a bugger (not the real word he used but your kid might read this) to work on but you’ll never recognize it when I get through with it.” He was right. Terry should be considered a jeweler.Not the kind making rings and bobbles,but the Swiss watchmaker kind. His creations aren’t just eye-candy they work, and they’re reliable. The everyday working cop needs a gun that’ll go bang every time he pushes the go button. There are a lot of guns out there beautifully finished and finely accessorized, but if they don’t go bang each and every time you pull the trigger you might as well put a gold chain through them and wear one as a necklace to the next squad barbeque. Now that’d be a fashion statement. Terry’s magic is combining the two disciplines and coming up with something artfully beautiful you can trust with your life. His modi?cations to my P-14 were all with reliability in mind cop necessary reliability. First the stock, curved Para rear sight and front sight came off to be replaced with Novak adjustables, for a perfect zero no matter what load you reshooting. He added a match bushing providing consistent 1″ groups at 25 yards.The Para shot very well before, but now it’s a laser beam. Terry also ?tted an Ed Brown steel mag catch, grip safety and mainspring housing. He replaced the firing pin stop and the trigger Terrys elected is from King’s Gun Works,especially made for the widebodied Para frame. He tuned it to a crisp 4 lbs. break just right for a duty 1911. The reliability package is critical on an LE gun, especially a 1911. Terry pays special attention to chamber specs, the link ?t and the cut, angle and surface ?t of the full-length guide rod. He polishes the ramp, barrel throat and the bolt face.He also checks and adjusts the extractor. Terry works with a lot of cops to get their sidearms “up-to-snuff.” He has a true understanding of what happens when you carry a gun in your Sam Browne every day. It’s evident when he makes suggestions for 1911 carriers. I can’t count how many wide-eyed stares came my way due to a cocked-and-locked 1911 in my duty holster. Trying to explain to a California-raised and insulated, Oprah and Rosie watching soccer mom it’s the safest way to carry a 1911 pistol is like trying to explain Quantum Entanglement Theory to a class of second graders. Actually the second graders are easier. In order to save me from furtherfrustration with the ill-informed, Terry installed a Safety Fast Shooting (SFS) kit to the P-14. Cylinder & Slideoffers the SFS for 1911 pistols and Browning Hi Powers. The system can be installed in a Series 70 or Series 801911. When it’s installed in a Series 80 gun, the ?ring pin lockout system is stillfully functional. The SFS allows the hammer to be cocked and then manually pushed forward giving the appearance of the hammer being in the down position. A metal bar prevents ?ring if dropped. When this is done the ambidextrous safety control moves into the “safe” position. The safeties are deactivated and the hammer pops back into the cocked position by simply pressing the safety lever to the “off-safe position” with the thumb. The trigger pull remainslight and crisp, allowing a very fast ?rst shot. It takes a little getting used to, but after about a hundred draws and shots it’s as easy as breathing. “Life’s too short to shoot an ugly gun.” I don’t know who said it but that line is something to live by. Terry decided on matte hard chrome for the finish on the Para. 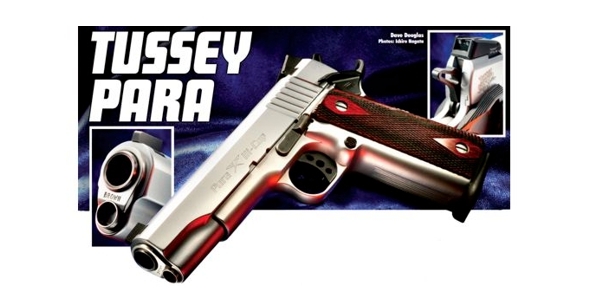 And it’s not one of those “beauty is only skin-deep issues.” Hard chrome not only is mighty pretty to look at but it’s also practically impossible to mar or wear off even when you use a Kydex holster. It provides great rust resistance too. The gun was dehorned stem to stern in what Terry calls his Carry Bevel. It makes shooting easier on the hands and it’s also much easier on your holster. Terry’s ?nishing touch to the Para P-14*45 is the installation of double-diamond checkered rosewood grips from Smith and Alexander. Aftermarket Para grips can be dif?cult to ?nd but Smith and Alexander provides a number of choices and these are a stunning example. This is a perfect example of taking a serviceable but worn duty gun and with a few parts and imagination, you come away with a gun better than new. You just need an artistic-perfectionist-craftsman-Swiss-watchmaker-jeweler-gunsmith to do it for you that’s all. It’s a pretty daunting task to ?nd that fellow but now you know who fits the bill. Terry Tussey’s that guy.